Our new Waterproof Boat Trailer Starter Light Kit gives you an easy and fast way to add greater illumination to your boat trailer. Using our Power-Link Technology, we have provided the easiest installation of any trailer backup light kit on the market. With the provided PLC-TX6 6 button controller, upgrading your system to include side illumination, axle lights, back up lights, or wheel well lights is simple and fast. 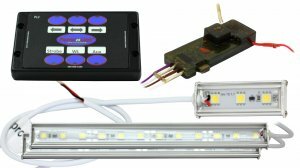 The Starter Kit includes the PLC-TX6 6 button controller pad to plug into the cigarette lighter of your truck, the Injection Molded Waterproof PLC-RX Receiver board, One JL3 3 LED Waterproof Light Strip, and Two JL12 12 LED Waterproof Light Strips. Includes instructions and mounting hardware. Our LED Light Strips are extruded from a single piece of solid aluminum, making them the toughest on the market. Also, with our lifetime warranty on electronics and LEDs, you can rest assured you will always have the brightest and lowest profile lights on the lake.